UK-STOCK;It is assemble portable Sit up bench;Compact foldable adjustable design consumes minimal space;Decline bench made of high quality steel and thick pillow, max weight 200 kg/440 lbs;Ideal for your power training exercising at your home or in the gym. The curve design helps support the natural curvature of your lower back,with 2 dumbbell and rope suit for sit-ups,abdominal work,and upper body workouts;Spring speed ball could exercise your coordination and reaction velocity;you can also put the low end on a chair,so that it becomes a flat bench. 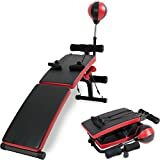 The ancheeer adjustable ab board with Solid and durable tubular construction is a versatile bench with a stylish thick comfortable padding provides supportive cushioning on workouts.